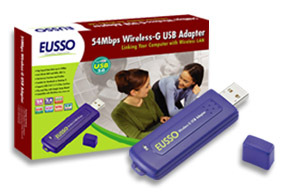 The Wireless-G USB Adapter installs in most desktop or notebooks and lets you put your computer almost anywhere in the building, without the cost and hassle of running network cables. Now you don't have to drill holes in your walls and climb through the attic or cellar to get connected to the network. Once you're connected, you can keep in touch with your e-mail, access the Internet, use instant messaging to chat with friends, and share files and other resources such as printers and network storage with other computers on the network. 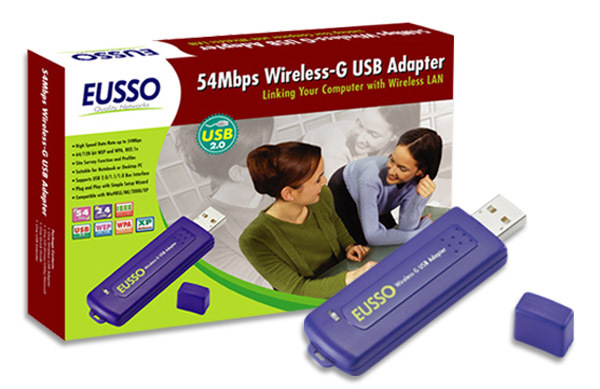 The Wireless-G USB Adapter connects you with Wireless-G networks at an incredible 54Mbps! And for added versatility, it can also interoperate with all the 11Mbps Wireless-B (802.11b) products found in homes, businesses, and public wireless hotspots around the country. And in either mode, your wireless communications are protected by up to 256-bit encryption, so your data stays secure. An Ad-Hoc wireless LAN is a group of computers, each equipped with one Wireless LAN adapter, connected as an independent wireless LAN. Computers in a specific Ad-Hoc wireless LAN must be configured to share the same radio channel. The adapter provides access to a wired LAN for wireless workstations. An integrated wireless and wired LAN is called an infrastructure configuration. A group of PC adapter/ card users and an Access Point can compose a Basic Service Set (BSS). Each PC adapter/card in a BSS can talk to any computer in the wired LAN infrastructure via the Access Point. EUSSO Technologies, Inc. is a dedicated data communication and networking company. With professional experiences in design, production, marketing and service support, we deliver the full range networking products including Gigabit Ethernet, Fiber Optic, Wireless LAN, Switches, Hubs, LAN cards, PCMCIA adapters, Converter, Transceivers. As well as Internet Telephony Gateway, Print Servers, Broadband Router and many others.